Richard Napier was born in Exeter on 4 May 1559 of a noble family descended from the Scottish Napiers, lairds of Merchiston, his father being the elder son, by a third wife, of Sir Archibald Napier (d. 1522), fourth laird of Merchiston. 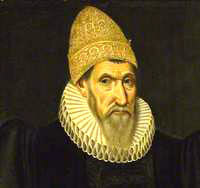 A cousin of Richard’s was John Napier, the celebrated mathematician of Napier’s Bones. Following matriculation from Exeter College as a commoner on 20 December 1577, Richard Napier studied Theology at Oxford University, achieving his BA in 1584. Reports vary as to whether he was actually awarded MA in 1586, but he was a Fellow of Exeter College from 1580 until 1590. Richard left Oxford in 1590 and was ordained. He was installed as rector of Great Linford, north Buckinghamshire, where he was to live and work for the next forty-four years until his death. He was never comfortable with preaching, and is said to have broken down in the pulpit early on in his ministry. He employed a curate to substitute for him, whom he supported with a salary and lodging in his own house. Erasmus Webb, archdeacon of Buckingham, awarded Napier a licence to practise astrology, in particular for medicine. Richard had studied with astrologer Simon Forman, after 1597. At first, Forman called him 'a dunce', but later Napier's talent for astrology and other personal qualities won Forman over. Forman quickly became a friend, and when he died in 1611 bequeathed Napier all his manuscripts. Both men knew and were strongly influenced by John Dee, Queen Elizabeth’s personal astrologer, alchemist, and conjuror. 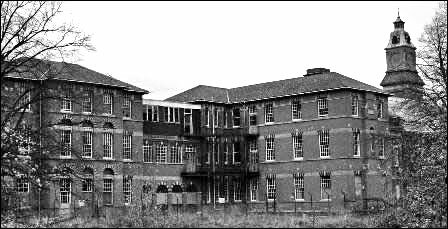 Napier built up a huge and popular practice at Great Linford, tending to the physical and mental problems of tens of thousands of patients. Most of his clients were lower and middle class people from farming and labouring families. His biographers say that his fees were on the low side for the times, and he would often give poor people free consultations. His rich clients may unwittingly have subsidised his pro bono work. Richard’s brother, Sir Robert Napier, traded in the Levant, and hobnobbed with the Duke of Buckingham’s friends. A quarter of Richard’s visitors included aristocrats like earls and lords, knights, baronets and their families, and many became personal friends. Perhaps the most notorious of these was the adulterous and 'lunatic' Viscount Purbeck, John Villiers, brother to the Duke of Buckingham. Most of Napier’s clients came from the immediate neighbourhood, but towards the end of his life visitors are recorded from much further away, for example, from Yorkshire, Lincolnshire, Shropshire, Dorset, and Somerset. Richard trained two of his curates to his methods and they too became astrological physicians. Richard Napier, following his mentor Forman’s example, kept meticulous handwritten notes, seemingly on every consultation. These have now been digitised and can be viewed at the Cambridge Library Collections. Napier records about 5% (2000) of his clients as having mental or physical afflictions. He himself suffered from “mopish melancholy”. Like his patients, he worried about his place in the spirit world, and he gave people advice that would help them with many conditions, from currently orthodox medicines, through religious and moral counselling to astrological magic. He used purging and bleeding, prayer, horoscope casting, charms and ritual exorcism at different times. On other occasions he would forecast the outcome of horse races and the likelihood of success for marriage partnerships. There is some evidence that Napier discoursed with the Archangel Raphael when he needed outside help. Conjuring, or necromancy was a capital crime during this period. By proclaiming moderate, conforming Anglicanism Napier stayed out of trouble, disparaging both Catholics and Non-conformists publicly. Many learned churchmen visited him to use his library and learn about his astrological work. He never broadcast his magical interests and practices, but his medical notes, now in the Bodleian Library, comprise sixty volumes, as well as his numerous correspondence, and unpublished tracts and treatises. Napier spent a great deal of time on his knees in prayer, rendering them very “horny”, and eventually died on his knees in prayer at Great Linford on 1 April 1634. He was buried there two weeks later. His epitaph says that he was 'the most renowned physician of both body and soul'. He bequeathed almost his entire estate to his nephew and pupil, Richard Napier, who sometimes shared his uncle’s work, as well as money to remodel the kitchens at Exeter College. Where "Anonymous" appears this seems to be a person accompanying a patient, such as a child. The first digit in notes, followed by "y" seems to indicate the person's age on the date of the consultation. 34216 13 14 October 1608 7:00 A.M Elizabeth Archer 60 y. Octob 14 ♀ ho. 7. a. m. 1608. 17828 6 2 September 1602 12:15 P.M Mary Ashby 2|4|4 y. Sept 2. ♃ hor. 12. 15. p m. 1602. 18629 6 2 February 1603 1:00 P.M Mary Ashby y feb 2. ☿ hor 1. p m 1603. 17494 6 15 July 1602 7:55 A.M Anonymous and Thomas Beauchamp a yere & 3 quarters. old. Iuly. 15 ♃ hor 7. 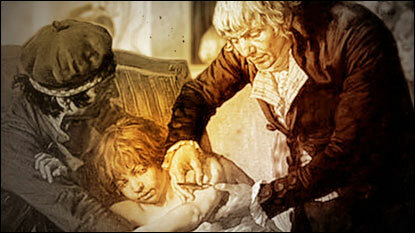 28754 10 22 April 1605 7:00 A.M Thomas Beauchamp 50 y Apr 22. ☾ h. 7. 160 ant m 1605. 58328 38 29 April 1624 3:00 P.M Susan Beauchamp 12 y full \of Cosgrave./ Ap 29 ♃ h. 3. p. m. 1624. 32528 12 7 January 1608 9:50 A.M Anonymous and Robert Bignell 8 y Ian 7. [illeg]|♃| h. 9. 50 ant m 1608.hart ill four days ill.
40898 22 12 February 1613 9:49 A.M. Anonymous and John Bignell 5 y feb 12 ♀. h. 8|9|. 36|49|. ant m 1613. 47719 29 21 October 1618 4:30 A.M John Bignell 50 y octob 21 ☿ h. 4 30 ant m 1618. 21302 9 28 July 1604 7:25 A.M Mr Nathaniel Kirkland Iuly. 28. ♄ hor 7. 25 ant m 1604. 17738 6 16 August 1602 3:00 P.M Mrs Elizabeth Bradshowe August 16 ☾ hor 3 p m. 1602. 53483 34 18 January 1622 10:30 A.M Mary Clare 64. y Ian. 18. ♀ h. 10. 30. ant m 1622. 18037 6 4 October 1602 1:20 P.M Elizabeth [Isabel] Clark widow Emmersons servant 22 y. Octob 4. 15606 7 21 September 1603 11:45 A.M Elizabeth [Isabel] Clark 24 y. Sept. 21 ☿ ho 11. 45 a m. 1603. 22030 9 9 March 1605 10:09 A.M Edward Clark 69 y. martij 9 h [sic] hor. 10 [illeg] ant m 1605. 46363 28 9 April 1618 1:30 P.M Isabel Cole 40 y Ap. 9 ♃ h. 1. 30 p m 1618. 62570 41 9 December 1626 1:40 P.M Margaret Cook 46 y decēb. 9 h [sic] hor 1. 40 p m 1626. 54920 36 11 September 1622 2:00 P.M Elizabeth Dickins of Dunsanger [sic] \Cosgrave/ wth Mr Mansell. 48157 29 30 January 1619 11:30 A.M John Elliot 40 y a batcheler Ian 30 h [sic] hor 11. 30 ant m 1619.
pulent. for her selfe. Marche 1. die ♃. h. 11. 55. 1599. 15299 7 13 July 1603 8:45 A.M Elizabeth Emerson 19 y. Iuly 13 ☿ ho. 8. 45 [illeg] a m. 1603. 15629 7 24 September 1603 12:30 P.M Mr Francis Emerson sept 24. h [sic] hor. 12 4|3|0 p m. 1603. 16098 7 21 January 1604 11:38 A.M Goody Anne [Agnes] Emerson [the elder] 50 y Ian 21 ♄ hor 11 38 ant m 1604. 13863 8 22 June 1603 9:00 A.M. Goody Anne [Agnes] Emerson [the elder] Iune 22 ☿ hor 9. ant m. 1603. 13865 8 22 June 1603 9:00 A.M John Emerson 16 y. Iune 22. ☿ 9. h. 1603. 20961 9 3 April 1604 2:40 P.M Goody Anne [Agnes] Emerson [the elder] francis Emmertons mothr. Apr 3 ♂ hor 2. 40 p m 1604. 21031 9 11 April 1604 3:45 P.M Mr Francis Emerson 34 y.\ Apr 11 ☿ hor. 11 3. 38. 3. 45. p m 1604. 28576 10 9 April 1605 12:30 P.M Ellis Emerson 32 y. Apr 9: ♂ h. 12. 30 p m. 1605. 31815 12 29 June 1607 2:30 P.M Bridget Emerson 23 y Iune 29 ☾ h. 2. 30 p m. 1607.
tooth ach & hed ach. 39456 21 25 March 1612 9:50 A.M Matthew Emerson 40 y march. 25. ☿ h. 9. 50 ant m 1612. 41055 22 22 March 1613 10:40 A.M Anonymous and George Emerson his sonne 5 y eodē tempore for an ague. 43291 25 30 April 1616 5:00 P.M. Anonymous and Catherine Emerson 3 y. Ap 30 ♂ h. 5. p m 1616. ague. 44597 26 2 April 1617 11:00 A.M Hugh Emerson 23 y Ap 2 ☿. h. 11. ant m. 1617. 67261 44 27 October 1628 7:39 A.M Goodwife Elizabeth Emerson 29 y octob. 27. ☾ h. 7. 39 ant m 1628. 71193 49 6 January 1631 9:00 A.M George Emerson 22 y Ian 6 ♃ h. 9 ant [sic]/ ant m. 1631. 29857 10 2 November 1605 2:25 P.M Millicent Fisher 24 y a serv. novēb. 2 h [sic] hor 2. 25 p m 1605. 35439 16 19 April 1609 8:40 A.M Anne Fisher 23 y. April 19 ☿ ho. 8. 40 a. m. 1609. 35759 16 18 May 1609 9:20 A.M Joan Fisher 31. y May. 18. ♃ 8. ant m. 1609. 40781 22 13 January 1613 1:39 P.M Young Mr Edward Furtho borne vppō tuesday the 28 of septēb. anno 1596. h 6 post m.. sent vnto me Ian. 13 ☿ h. 1. 39 p m 1613. 40936 22 18 February 1613 5:00 P.M Young Mr Edward Furtho 16 y feb. 18 [illeg]|♃| h 5. p m 1613. 46340 28 3 April 1618 3:00 P.M Young Mr Edward Furtho 21 y. last milkemas. eve about six at night. came Ap 3. ♀. his should vnto his armes & fyngers & legs. 24336 23 1 March 1615 2:00 P.M Anonymous and Anthony Garner 7. y. martch. 1. ☿ h. 2. p m 1615. 33003 13 10 March 1608 4:00 P.M Thomas Gravestock serv. to mr furthoe 38|4| y march 10. ♃. h. 4. p m 1608. 47690 29 17 October 1618 10:28 A.M Ellen Gorman 50. y. octob. 17. h [sic] hor 10 28 ant m 1618. 47658 29 14 October 1618 10:30 A.M Elizabeth Johnson 36 y octob. 14. ☿ h. 10 30 ant m 1618. 47689 29 17 October 1618 10:20 A.M Goodwife Johnson 32 y Octob 17. h [sic] hor 10 20 ant m 1618. [ra]ck & harte maketh her to vomitte Octob. 22 die ☾ h. 12. 61806 41 20 March 1626 9:45 A.M Anne Maple 29. y. 2 child march. 20 ☾ h. 9. 45 ant m 1626. 38110 20 11 May 1611 3:15 P.M Joan Mortimer 60 y May 11 h [sic] hor. 3. 15 p m. 1611. 29992 10 23 November 1605 1:00 P.M Anonymous and John Moulsoe 3 y nov 23. h [sic] hor. 1 p m 1605. 30623 12 11 February 1607 8:30 A.M. John Moulsoe Iohn Moulsoe sent his water feb. 11 ☿ h. 8. 30 ant m 1607. 34583 13 17 December 1608 4:00 P.M Mary Moulsoe 30 y decēb. 17. h [sic] hor 4. p m 1608. 37139 16 6 March 1610 8:30 A.M Mary Moulsoe 32 y march 6 ♂ h. 8 30 ant m 1610. 51395 32 13 August 1620 8:15 A.M Anonymous and Thomas Moulsoe 6 y Aug 13 ☉ h. 8. 15 ant m 1620. 20590 9 18 February 1604 11:15 A.M Alice Parker 40 y febr 18 h [sic] hor 11 15 ant m 1604. 47086 28 15 July 1618 11:40 A.M Mary Parsons his daughtr 17 y Iuly 15 ☿ h. 11. 40 ant m 1618.
novēb. 21. ☾ h. 1. 30 p m 1625. 13708 8 27 April 1603 10:30 A.M Henry Rivys at the same tyes [sic] for his ey dymed. 27394 11 27 May 1606 11:15 A.M Anne Rose 16 y may 27. ♂ h. 11. 15. ant m. 1606.
in prsenc a very good water. 31397 12 5 May 1607 12:00 P.M. Goody Rose and five children may 5 ♂ h. 12. 1607.
had a calfe bitten wth a mad dog wch was gydy & the [sic] knocked it in the hed & this dog did bite five of her children & snapped some in the hand some in the feete. 33790 13 18 July 1608 11:25 A.M William Rose 7 y Iuly 18 ☾ h. 11. 25 ant m 1608. 23517 23 3 June 1614 2:30 P.M William Rose 48 y Iune 3. ♀ h. 2. 30 p m. 1614. 5 weekes that he can scarce styrre him in his bead. 10730 4 31 May 1600 10:15 A.M Mr John Spencer servant to mr Robarte Spencer 23. may 31 die ♄ h.
19466 5 26 June 1601 9:00 A.M John Spencer 26|4||3| y. Iune 26 die ♀. 20688 9 3 March 1604 8:40 A.M Mr John Spencer serv to my L Spener [sic] 24 y martij 3 h [sic] hor 8. 40 ant m 1604. 29393 10 13 July 1605 8:30 A.M Anonymous and John Spencer 5. y. old Iuly 13 ♄ hor 8. 30 ant m. 1605.
kings evill 2 y. y [sic] & a halfe. 22 y. Aug 29. ♃. h. 10. ant. m. 1611. 47016 28 6 July 1618 9:40 A.M Anonymous and Anne Tomlin borne feb 17. h [sic]. hor. 4. ant m. 1618. 1615. 12157 3 27 March 1599 3:15 P.M Goody Joan Walbank 50 yeres old for her hed & a paine vndr her right side. leeke scabs on her legs.back head shoulders armes. 17361 6 26 June 1602 11:00 A.M Jane Walbank Iune 26. ♄ hor. 11. ant m. 1602. 14022 8 17 September 1603 11:25 A.M Jane Walbank sept 17 h [sic] hor. 11. 25. ant m 1603. 28904 10 4 May 1605 9:00 A.M. Jane Walbank 18 y maij 4 h [sic] hor 9 ant m 1605. 24981 18 9 June 1610 9:30 A.M Jane Walbank 23 y Iune 2 9 h [sic] hor. 9. 30. ant m 1610. 39407 21 21 March 1612 11:30 A.M Jane Walbank 25 y march. 21. h [sic]. hor. 11. 30 ant m. 1612. 29942 10 14 November 1605 2:00 P.M Mrs Whaley h. 1. 30 p m. 1605.
m. 1606. & her daughtr mary 3 y. 59345 39 21 October 1624 4:20 P.M Mrs Anne Whaley 14 y octob. 21. ♃ h. 4. 20 p m 1624. 13855 8 19 June 1603 1:46 P.M John Wright 10 y. Iune 19. ☉ hor 1. 46 p m 1603. The public nature of this footpath became a major issue in 1771. At this time Green Farm was leased to a man from Roade, named Richard Whitmay. He evidently opened the house as a hospital or nursing home for those suffering from smallpox. He took in people from other parishes, and also started inoculating people, presumably using the “variolation” technique of applying pus from his existing patients into incisions in the skin of healthy persons. Twenty years later we know from the Cosgrove Poor Book records that such inoculations cost 7s 6d. 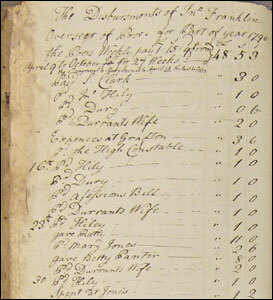 At the time a man’s daily wage was 1s 4d, so Mr Whitmay was making a great deal of money. Major Mansel, at Cosgrove Hall, the local magistrate, sent men to stop this practice, pointing out to Whitmay the risk of spreading smallpox throughout Cosgrove, especially since people would walk right past the farmhouse to get to the mill every day. Whitmay was not the least disturbed by Major Mansel and continued to operate his business from Green Farm. He inoculated his four children to demonstrate the safety of his treatments, and disastrously his youngest child, Molly, died of her father’s experiment and was buried at Cosgrove Church on February 27th 1771. 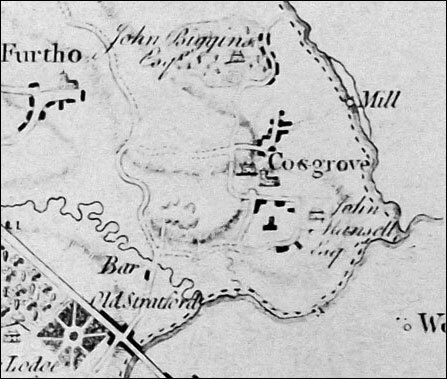 “Inoculation may be a good thing but it should be done in proper places; if a man does it in a town he threatens to ruin all his neighbours.” Cosgrove, although around the same size as it is today, was always referred to as “the Town” at this time. 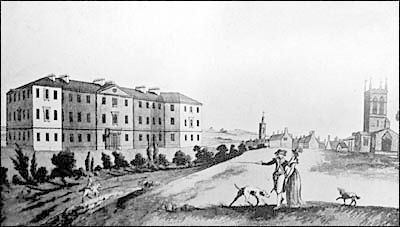 This plan, attributed to Eyres in 1779, shows the proximity of John Biggins’ estate to the Green and the position of the Mill at that time. As a result of these outraged comments, an indictment was made to prosecute Whitmay at Northampton Lent Assizes in 1772. Sadly, records for this case have been lost, or at least, not found at the time of writing. However, as Whitmay appears in no further records in Cosgrove, it may be supposed that he was forced to leave the village. Whether the farmhouse was altered, rebuilt or re-sold at this point we have yet to discover. The documentation of this case says that Whitmay leased Green Farm. Clearly he did not lease it from either of the two main landowners at this time, Major Mansel, at Cosgrove Hall, or John Biggin, at the Priory, since either of them would have terminated his lease to close his “hospital”. The ownership of Green Farm for the next half century is therefore unclear. None of the public lists and records show the names of farmers or owners linked to the names of the farms. Presumably in this tight community it was a matter of public knowledge and therefore not worth writing down. We may yet find additional clues!